The geomagnetic field was quiet on September 24. Solar wind speed ranged between 313 and 357 km/s. 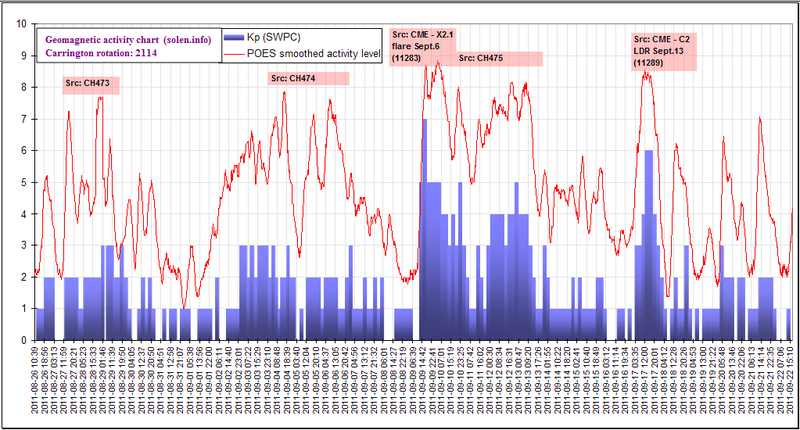 Solar flux measured at 23h UTC on 2.8 GHz was 168.7 (increasing 67.7 over the last solar rotation, and the highest non-flare enhanced solar flux measurement of cycle 24. 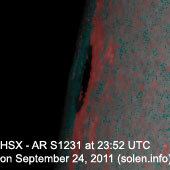 The measurements at 17 and 20h UTC were both flare enhanced). The planetary A index was 4 (STAR Ap - based on the mean of three hour interval ap indices: 3.6). 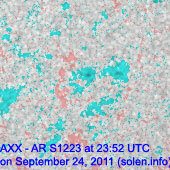 Three hour interval K indices: 00012122 (planetary), 10112122 (Boulder). 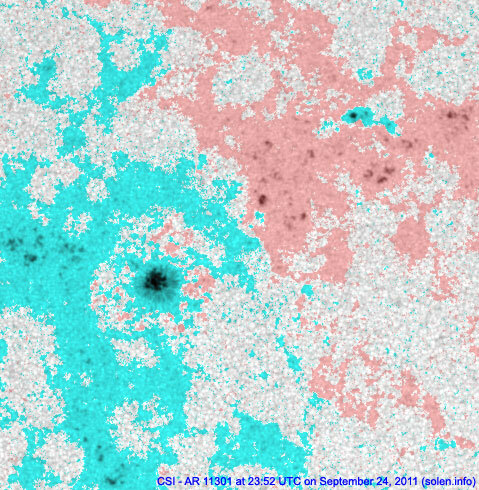 The background x-ray flux is at the class C3 level. 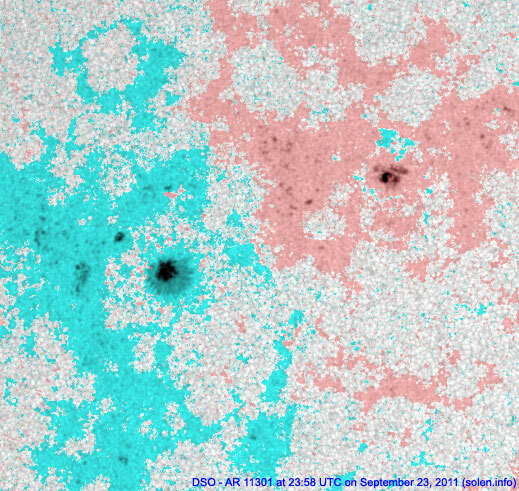 Region 11295 [N24W84] developed further in the trailing penumbra which became very complex with a strong magnetic delta structure. 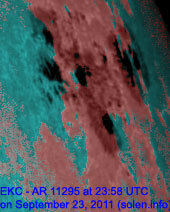 A major flare is possible as the region rotates over the northwest limb. Flares: C5.9 at 07:04, C2.2 at 08:43, M1.7 at 16:58 (not reported by SWPC), M2.7 at 18:19 (not reported by SWPC as they failed to separate this event from another event which started earlier in region 11302) UTC. Region 11301 [N20E02] lost all penumbra on the leader spots. 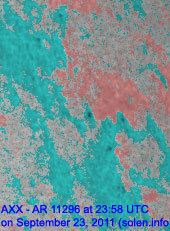 The region has many tiny, widely scattered spots with polarity intermixing again occuring in the northwestern part. 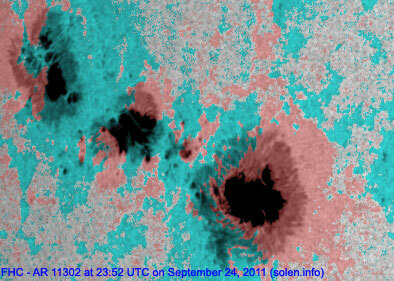 Region 11302 [N13E50] has a small magnetic delta structure in the northeastern part of the leading penumbra. A much more significant delta exists in the central penumbra where a realtively large positive polarity umbra is sandwiched between two fairly large negative polarity umbrae. 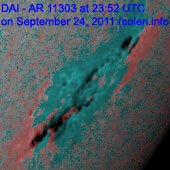 As long as this delta exists the region will continue to produce M and X flares. Flares: major impulsive X1.9/2B at 09:40 (associated with a small CME), C2.7 at 11:31, major M7.1/1B long duration event peaking at 13:20 (associated with a huge, fast, wide CME), M3.1 at 17:25 (wrongly attributed to region 11295 by SWPC), M2.8 at 18:05, M3.0 at 19:21, major M5.8 at 20:36 UTC. Early on September 25 the region has produced an M4.4 flare at 02:33 (with some contribution from region 11303 which flared simultaneously), and a major M7.4 long duration event peaking at 04:50 UTC. 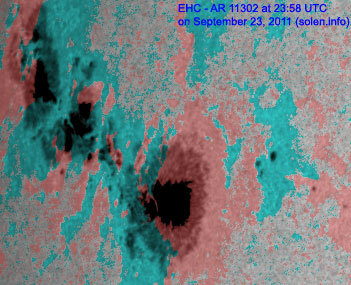 The latter event is likely to have been associated with a large CME. 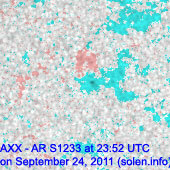 New region 11303 [S28W66] emerged in the southwest quadrant on September 23 and was numbered the next day by SWPC. The region developed rapidly during the latter half of the day with a magnetic delta structure forming in the very elongated penumbra. Further M class flaring is likely. 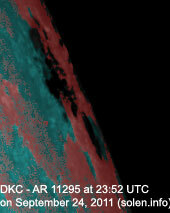 Flares: M1.3 at 21:25 (not reported by SWPC) and M1.0 at 23:54 UTC. New region 11304 [N12E22] emerged slowly and was quiet. 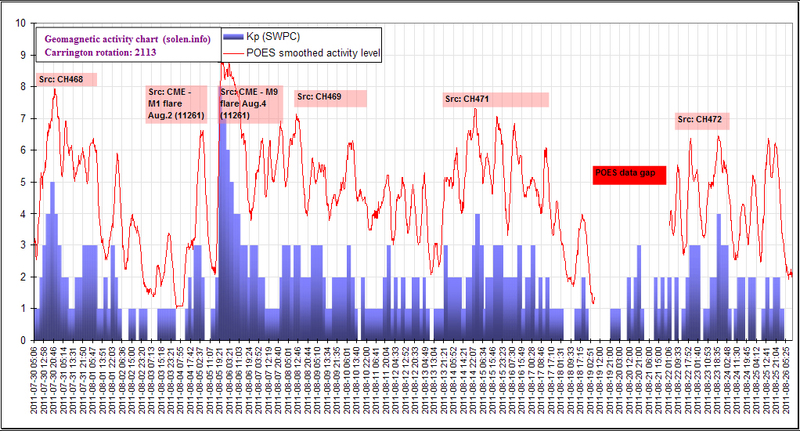 Minor update added at 11:45 UTC on September 25: A fairly weak solar wind shock was observed at ACE near 11h UTC, the arrival of the CME associated with the X1 event in region 11302 on September 22. Region 11303 generated an M1.3 flare at 07:05 and an M1.5 event at 09:35 UTC. Region 11302 was the source of an M3.1/1N event at 08:49 UTC. 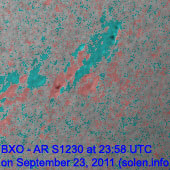 September 22: An unusually large and wide CME was observed after the X1.4 event in region 11302. 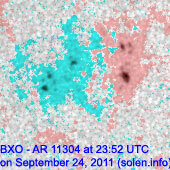 While it is rare that limb events cause geomagnetic storming, this CME could when it arrives, probably on September 25. September 23: No obviously Earth directed CMEs observed. September 24: A huge, fast and wide (asymmetrical) full halo CME was observed in LASCO following an M7.1 LDE in region 11302. This CME will likely reach Earth on September 26 and cause active to major storm conditions. 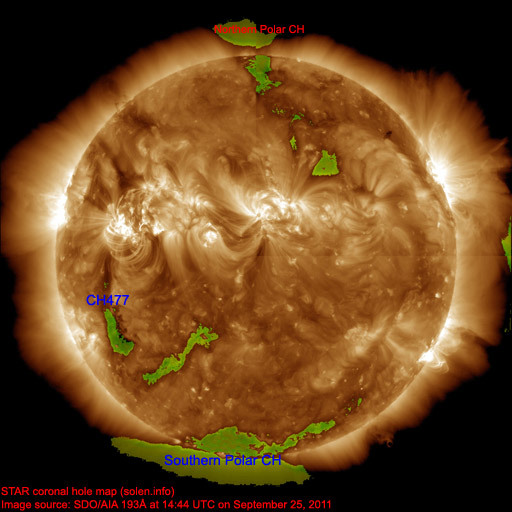 A recurrent coronal hole (CH477) in the southern hemisphere will likely rotate into an Earth facing position on September 28. 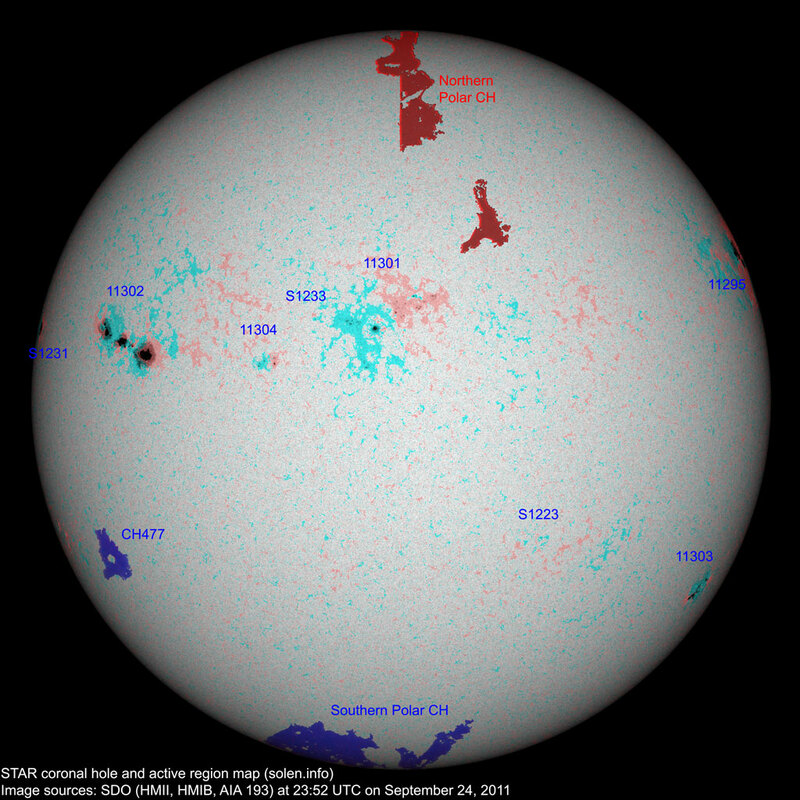 The geomagnetic field is expected to be initially quiet on September 25. A CME associated with the X1.4 flare on September 22 could arrive during the day and cause unsettled to minor storm conditions. Another CME impact is likely on September 26 and could result in active to major storm conditions that day and on September 27. If the current situation in region 11302 persists we can expect lots of geomagnetic storm intervals until at least October 5.